Welcome to Iola! Our beautiful historic homes, parks, walking trails, rich history and historic sites make Iola a great place to visit! At the crossroads of 54 and 169 highway, you'll find Iola's quaint hometown friendliness and treasurers enchanting. Drive or walk our historic downtown courthouse square (which is the largest in the United States). 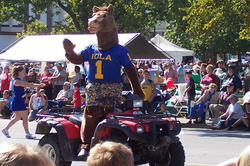 Or let Iola's Fearless Fred Trolley show you what Iola has to offer! Explore the adventures of Major General Funston or shop in one of the many victorian stores downtown. Enjoy our great outdoors by riding on one of Thrive Allen County’s courtesy bicycles (for free) and explore the trails in Iola and outside Iola. On one of Iola’s Trolley tours you can find out about our rich candy making history that will lead you to current tantilizing pleasures at Russell Stover's. Choose from the excitement of Iola’s Farm City Days celebration, to our downtown nostalgic Christmas Holiday activities, the Holly Trolley To ur, Christmas Lights Tour, Santa House, Gingerbread Walk, the Iola Free Public Library, Allen County Historical Society Museum, Iola Community Theater and Bowlus Fine Arts productions, Kiwanis Easter Egg hunts, Old Jail Museum, quaint Shopping options all over town! Stop by the Chamber to get information about the other interest spots in town. Visitors always tell us, "Iola is a trip worth making!"